Please don't fuss at me for the slow posting and the lack of outfit posts. I've been working hard on things dealing with the book, The Curvy Girl's Guide to Style, as it's launch is sneaking closer and closer. Last Thursday, I had the pleasure of hosting an event with Jibri at Ditto Boutique in my new hometown of Dallas. The event was lovely, but what was even more lovely was this dress, the wavy sweety strapless, I scored from Jibri for $240, which I got a nice little 10% event discount. I paired this dress with a oversized pearl necklace that I got from Target. And please check out the details on this dress. For a pear shape like me, I lack in the busy area. This is a gathered bust done right. And of course the waist definition is flawless. No belt needed. Bravo! Of the guests that were attendance, I got to meet the lady behind the Style Geek blog, Isabel Morales. She really knows her Dallas Fashion. I hope you guys like the outfit post. I adore this dress and please don't hate me if you see in me the street wearing it. It's too adorable not to do twice! This dress is fantastic and fits you wonderfully! The dress is to die for, you look fab! Yes, i think i hate you for having that dress!!! Loving that dress... wish I could see your shoes better. I am top heavy and that dress would probably NOT look the same on me... but BRAVO!!! You are ROCKING IT!!! I love this dress. 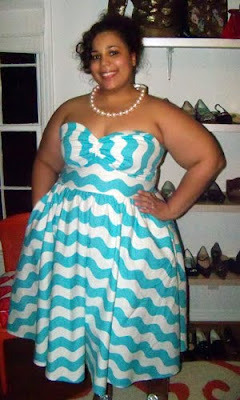 I just saw the editorial of Jibri's spring line on Madison Plus and this dress was on the red head model. This dress looks great on you. Let me rephrase, this dress looks MAJOR! I loooved modeling that dress for Jibri...one of my favorites from the spring collection. It's super sweet, AND looks lovely on you! Fantastic looking dress. What a great fit! The colours are so "retro" too, haha. Wow! You look great in that dress! Is that one of the limited pieces from Jibri? You always seem to get pieces that no one else can get! Was that custom for you?